Why ASKME is the BAAP of all applications... A honest review. Home » Blog » Internet » Reviews » Why ASKME is the BAAP of all applications… A honest review. Why ASKME is the BAAP of all applications… A honest review. To tell you the truth, I don’t know how to write impressive / touchy lines about anything. Here, I’m just starting my blogging journey by presenting this ASKME app review. Here, I will discuss, Why ASKME is the BAAP (father) of all applications. Forgive me for any grammatical / spelling errors :-). I downloaded this askme app mainly because of its new advertising promotion showcasing Ranbir Kapoor, declaring “Askme” to be the baap (father) of all applications. I was fascinated and while the app was being downloaded, I sent a rapid prayer to the lord saying ‘Let it not be yet another app which I remove within two hour of downloading’. It didn’t consumed very long to download, the size being around 10 MB (apple ipad). My first impression when I launched it was….. Well, this is one clean app. Yes, that’s the 1st ideal thing about this application. It appears neat. There is no chaos, no useless tabs, no pop up advertisements and it didn’t even asked me to sign in or register, which is the second best thing about this application. Further, I filled the two tabs, “What I’m hunting for?” and “Locality”. The outcomes almost came up instantly. Because the speed is everything now a days, and the people at Askme knows it for sure. 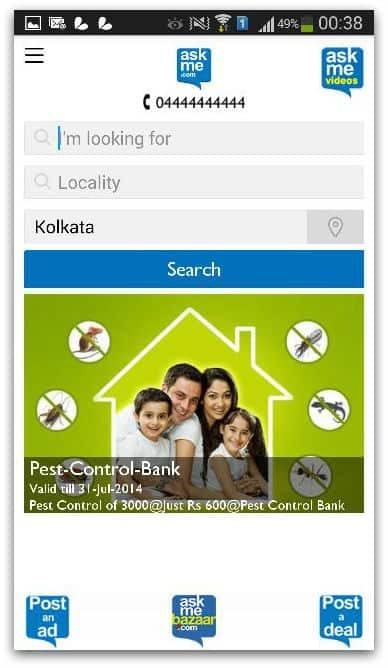 Askme has been advertised as a 4-in-1 app, i.e you can search, post advertisements, find offers and buy the products all at the same place. So, basically, you don’t have to go to Groupon, Zomato, Flipkart, Amazon or Ebay. Just Simply Askme :-). While scanning for the information, you can narrow your results further, by locality (Blocks, areas of the city) and product services (Dominos available at individual outlets, in mall outlets, Hotels, etc.). And if you are using the app on mobile, you can call on the outcomes straight from the app. The idea behind this app is excellent and if the execution goes as planned, it can honestly help in decluttering of our smart phones and tablets. Askme, the range topping product from “GetIt Infomedia”, is a 1 stop destination to find information related to anything or everything; be it restaurants, travel and tour, matrimony, employment, education, mobile, gadgets, etc. Their services are available on web (http://www.askme.com), mobile (application available on Google Play store and Apple app store), and voice (call 0444 444 444). The newest ‘Baap of all apps’ promotion has given the app the much needed publicity. It is a cool, clean and fast application. Search for ventures near you. Bring super deals offered by your favorite local ventures. Latest / Hottest classified listings on mobile, employment, cars, real estate and more. Include reviews, pictures, and tips for your favorite ventures. Create your own listing of your favorite local ventures. Check out reviews to understand about quality businesses in your town. Share favorite ventures with friends via SMS, email OR all your social networks. Search address and telephone numbers for 1000’s of ventures, and contact them easily from ASKME app. Further Business information, such as ratings, paying methods and opening up hours, to assist make your selection easier. That’s it, Hope you have liked this honest review straight from my heart. Feel free to share this among all your social networks OR you can add your opinion in the comments section below. Askme app Promo by Ranbir Kapoor.